The Embroidered Computer (2018). Ebru Kurbak, Irene Posch. Installation. Linen, gold, silver, copper, hematite, wood. 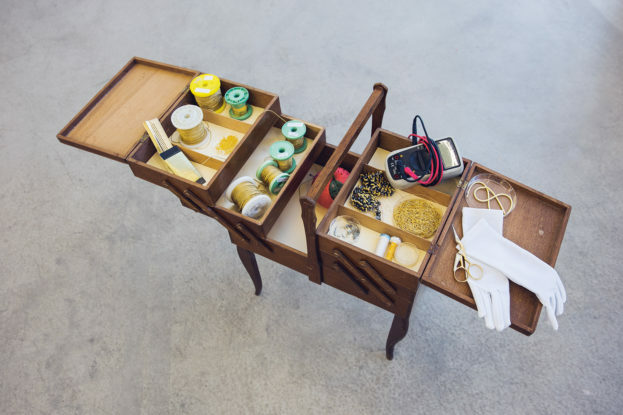 The Embroidered Computer is an 8-bit universal electromechanical computer comparable to early mainframe computers that were built in the 1950s in terms of its capacity and workings. 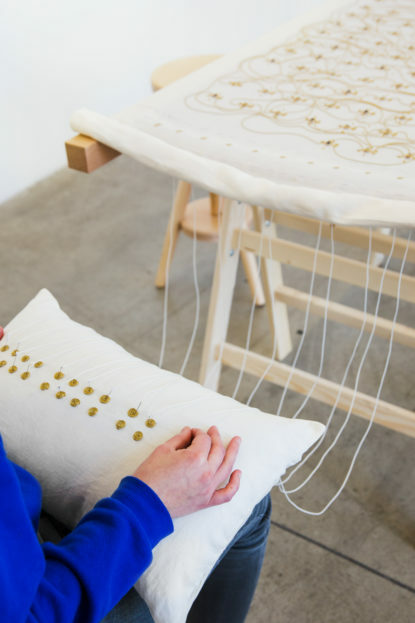 The distinctive feature of The Embroidered Computer, however, is in the manufacturing; it is handmade through traditional gold embroidery and does not incorporate any regular electronic components. 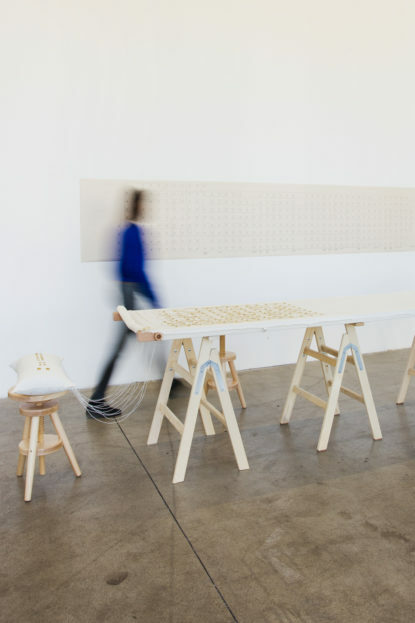 The piece demonstrates the possibility to make a computer from scratch through long-established alternative materials and skills. Through its mere existence, it evokes one of the many imaginable alternative histories of computing technology and stories of plausible alternatives to our present daily lives. 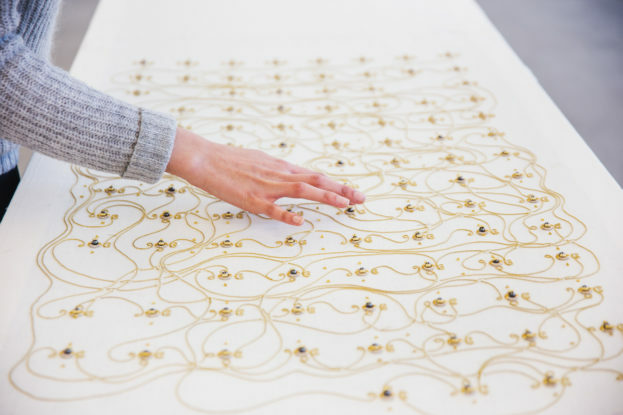 The smallest unit of The Embroidered Computer is a gold-embroidered electromechanical switch (relay), which is made of a handmade copper coil, a magnetic hematite bead, and adjacent gold and silver conductive surfaces. When an electric current passes through the coil, it generates a magnetic field, which affects the magnetic bead that sits in its center. Based on the direction of the passing electric current, the bead flips to one of the two directions and leads to the closing of one of the two contacts. Each switch, by receiving inputs and generating outputs in this way, channel the electric current to other switches through the connecting golden threads and make complex logical operations possible. In its complete design, the computer includes a total of 369 switches, constituting an 8-bit computer with 1-bit ALU multiplexed to four registers with an 8-bit register width and two additional storage registers.